In 2010 the Theatre de l’Ange Fou acquired a property in the United States, the Wyoming Valley Church (deconsecrated in 2008), situated in the country side near Spring Green, Wisconsin, and have transformed this 1902 church into a theatrical space. And so, was born The White Church Theatre Project, Inc. 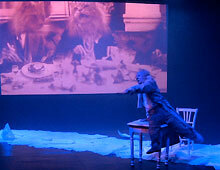 The goal of The White Church Theatre Project, its company in residence, the Theatre de l’Ange Fou, and it’s school the International School of Corporeal Mime, is to create and co-ordinate events specifically dedicated to the multifaceted art of Mime and Physical Theatre through the presentation of performances, lectures, films, and training programs. 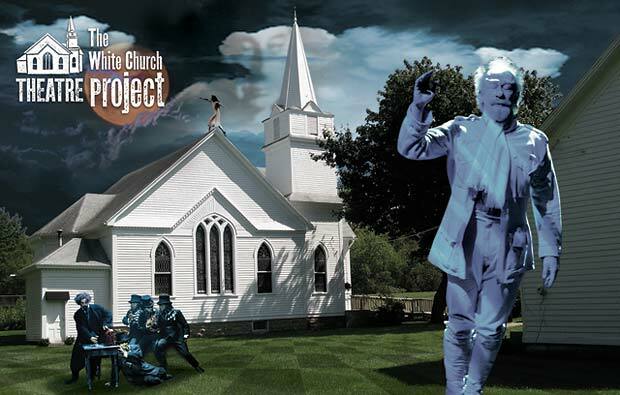 The White Church Theatre Project also welcomes other Mime and Physical Theatre Artists from across the U.S.A and abroad, and is open to local performers. The Mission of the White Church Theatre Project is, as well, to preserve and improve The Wyoming Valley Church, home of the White Church Theatre Project. The church is just down the road from Taliesin, the home and school of the great American architect Frank Lloyd Wright (1867-1959), and near the summer residence of The American Players Theatre. The progressive University of Wisconsin in Madison is a short distance away, and the Wyoming Valley is the home of many artists, writers and musicians. Steven Wasson began his mime and physical theatre studies in the 1970’s at The Valley Studio, just a mile from the church property, before departing to study with Etienne Decroux in Paris. Since 2012, the White Church Theatre Project has offered performances and films by the resident company, the Theatre de l’Ange Fou, performances by invited guest artists, and summer school and ongoing training programs dedicated to modern movement theatre and the work and legacy of Etienne Decroux. The creative work of the students is regularly presented before an invited audience, and the Theatre de l’Ange Fou also create new work commissioned by the Kanopy Dance Company, Madison, Wisconsin. The White Church THEATRE Project thanks the Spring Green and Wyoming Valley community for their welcome and support. 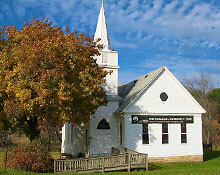 If you are interested in the activities of The White Church THEATRE Project, please email us. The White Church THEATRE Project brochure is available here to download. 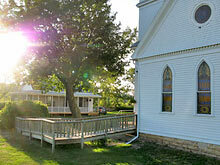 THE WHITE CHURCH THEATRE PROJECT is made possible by funding provided by the Wisconsin Arts Board, the Spring Green Area Arts Coalition and the BMO Harris bank. The White Church Theatre Project is also sponsored by the Alec Van Bercham Trust, Mrs. Doris Wasson and Ms. Aude Gotto. 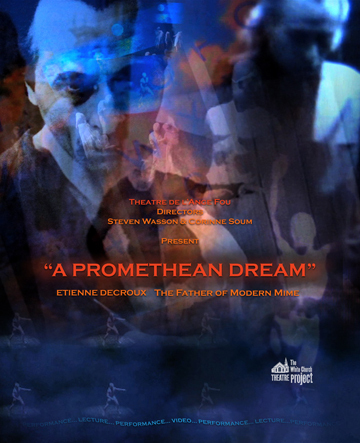 poster for the lecture/ performance “A Promethean Dream”, 2014.
from “Waiting for Ulysses”, 2013.
directing “A strange Day for Mister K.” for the Kanopy Dance Company, 2014. You can still email us as before - please use the contact page. Please note the Theatre de l’Ange Fou is now permanently based in the USA.